Carvin is thrilled to introduce their latest model, the ST300. This new model offers the features and choices of Carvin’s contemporary Custom Shop guitars with the timeless body shape that they offered back in the early 1990s. The body is more circular than the legendary DC series and has a waist and forearm cutaway for playing comfort, as found on the Contour 66. The Carvin ST300 model reflects the past 60 years of experience that Carvin has in building the best quality, USA-made instruments that are suitable for all playing styles. With hundreds of available options and like other Carvin Guitars, you can custom build your ST300 just the way you like it. 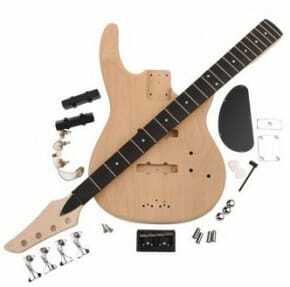 Carvin Woods–The ST300 has a standard alder body and maple neck-through design. Alder is a high-quality tone wood used by many makers because of its light weight and fine tone. It’s darker in color than maple, which accentuates the ST300’s maple neck. Alder has a subtle and attractive grain that looks good in any of Carvin’s many finishes, including solid colors, translucent finishes and our metallic solid finishes. Although alder is the standard wood, optional woods such as swamp ash, maple, mahogany, walnut and koa are available, all of which have their own tonal characteristics. You can add a 5mm premium top wood, such as AAAA flamed maple, AAAA quilted maple, flamed koa, flamed spalted maple, and California Claro walnut. The body of the ST300 has a waist cut as well as a deep forearm cutaway on the upper bout.. When an optional top wood is added, it is “bent” over the forearm cutaway, as on the C66. In conjunction with flamed and quited tops, you can choose Carvin’s natural body binding. This is a process that leaves the edges of the top wood unfinished, so that the body is bordered by natural wood, which provides a nice contrast when the body is painted. When this option is selected on the ST300, the edges are straight – they don’t have the 3/8″ radius found on ST300 models without the natural body binding option. The standard maple neck clarifies the tone of the instrument, but other neck woods, such as mahogany and koa are offered for their own slightly warmer tonal qualities. 5-piece necks of different combinations of maple, walnut and koa add to the great looks of this instrument. All of our necks and fingerboards undergo a long conditioning process in our de- humidification chambers to remove any stress in the wood. Carvin’s dual-action truss rod helps keep the neck straight and true. The standard headstock is a 6-inline version, and you can also choose a traditional 3 X 3, V style, CT style, pointed inline or reversed design. The ST300 features a standard 25″ scale ebony fingerboard with white pearl dot inlays, a 12″ radius and 24 medium-jumbo nickel frets. 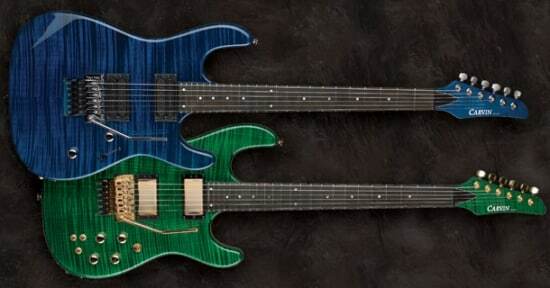 Carvin offers several fingerboard options than most manufactures offer for their entire guitar lines. You can choose from rosewood, maple or birdseye maple fingerboards; dot, diamond or block inlays in mother-of-pearl or genuine abalone; and fingerboard radii of 10″ or 14″. Carvin offers a number of fretwire options, including jumbo, low-wide and stainless steel. Carvin’s “Rapid Play” low action neck assures effortless playability throughout the entire fingerboard, while the smooth neck heel allows easy access all the way up to the 24th fret. You can choose from 5 different bridges. The FT6 fixed bridge is standard, or you can upgrade to the “M” bridge. You can choose a Wilkinson tremolo or a Floyd Rose tremolo with or without locking nut. Additionally, you can select a Bigsby vibrato in polished aluminum for classic looks and great vibrato tone. Sperzel™ locking tuners ensure you’ll stay in tune no matter what your playing style is. The electronics–ST300 come with a Classic Series C22B humbucker in the bridge, and a Classic Series C22J pickup in the neck position. All Carvin humbuckers have 11 polepieces per coil, which eliminates dropoff when bending strings. Controls consist of a master volume and tone control and a 5-way pickup selector. For added warmth, try Carvin’s S22 Series metal covered pickups. You can also choose from Carvin’s M22 Series or Holdsworth H22 Series pickups. Standard pickups have black coils and bezels, but any combination of black or cream coils and bezels are available. You can upgrade your ST300 to active electronics. Carvin offers the C66, which has similar ergonomics as the ST300, in a bolt-on neck design with a flamed maple top standard. Additionally, they offer the DC127, which has the same neck-through construction as the ST300, with our contemporary six-string body design. Both models offer many of the same standard features and options as the ST300. Appreciate the performance–Carvin encourages you to use it in your own environment, giving it the test of “real world” performance. Take 10 days to try out your Carvin ST300. If you’re not completely satisfied, you can return it – no questions asked. Your trial period starts when the merchandise is received by you, not when it’s shipped. If you’re not satisfied for any reason, send it back for a prompt refund or exchange. 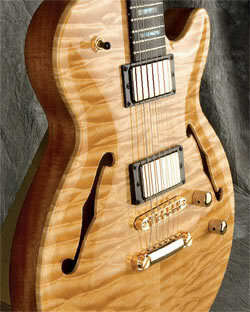 The Carvin ST300 guitar is built at Carvin’s Custom Shop in San Diego, California. Beautiful guitar.how can I find out more?